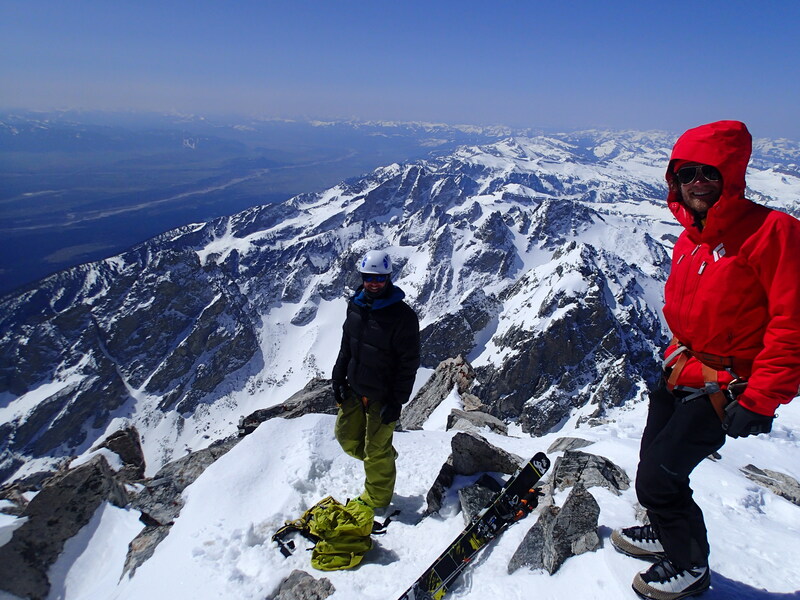 An epic ice climb up the Ford Stettner couloirs and a powdery ski/snowboard descent down the the monstrous Grand Teton mountain. 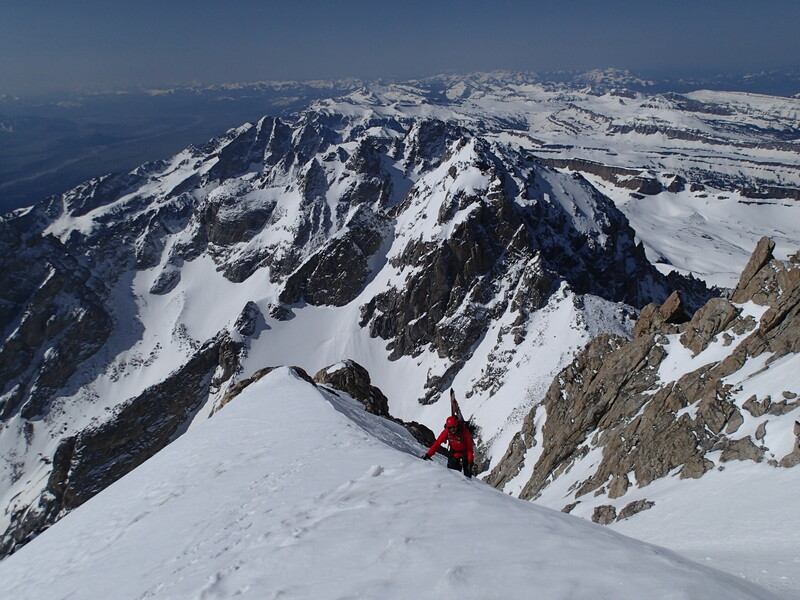 Choosing May 1st for our Grand Teton ski attempt had to do with a couple factors. Firstly, it was looking like a beautiful day that would hopefully produce some corn skiing up high. Secondly, May 1st is the day that the GTNP road opens past the Bradley-Taggart trail head. 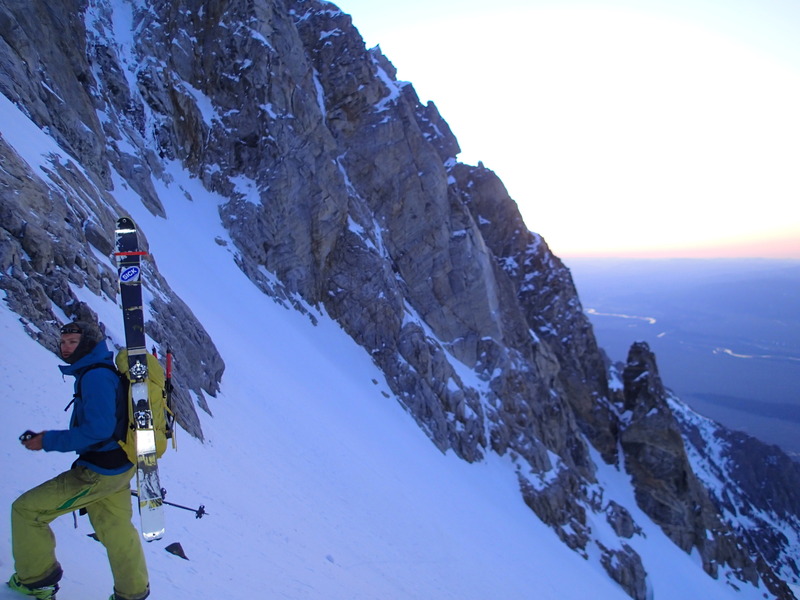 Adam, Dan, and myself had a genius plan devised to leave a car at Bradley-Taggart, hike the summer trail from Lupine Meadows in the wee hours, and after summiting and skiing the Grand, ski north facing snow patches down to Bradley Lake. Man, was it an idea! From Lupine Meadows we encountered stretches of dry and muddy trail, frozen snow drifts, and horribly isothermic post holing conditions. Put simply, the approach was variable. We managed to barely survive a grouse attack, and as we put that little devil in our rear view, we were thanking our lucky stars that we all had whippets to fend off the aggressive little bugger. Better than a bear attack during those groggy hours! Thanks to a really annoying injury in late January, my ski season didn’t offer too much preparation for a spring GT descent. Turns out doing PT, eating ice cream, and not ski touring doesn’t exactly get you ready for a long day in the mountains. It was okay, because I was on the slow and steady route to the top of the Tetons and was elated to be walking through the woods in the middle of the night with two good friends! 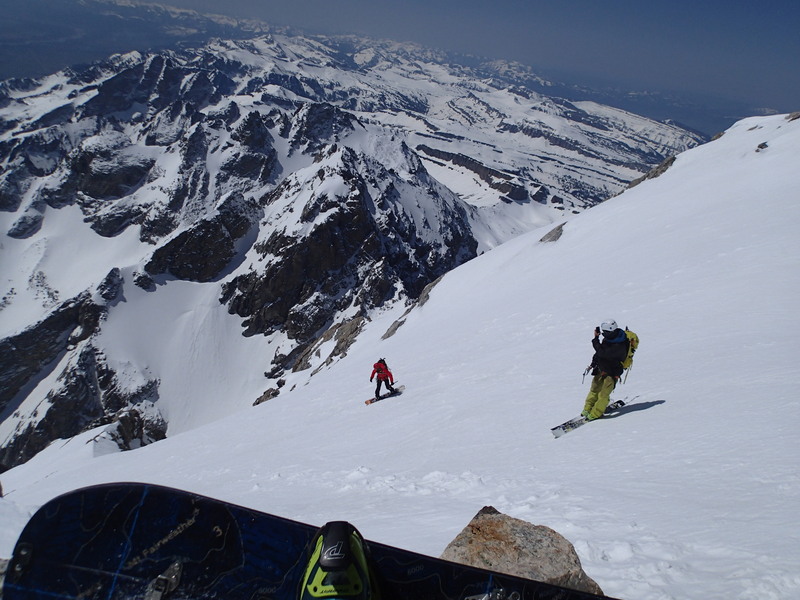 We reached the meadows and stashed some gear that we wouldn’t need until the descent. I forced down some shot blocks and we kept pushing on. Fast forward to the Teepee Glacier. Light is starting to glow on the mountain tops and we knew it wouldn’t be long until we got some sun on our faces. At the top of the Teepee we stashed some more gear and ripped out the ice tools. Love lightening the load as we ascend! 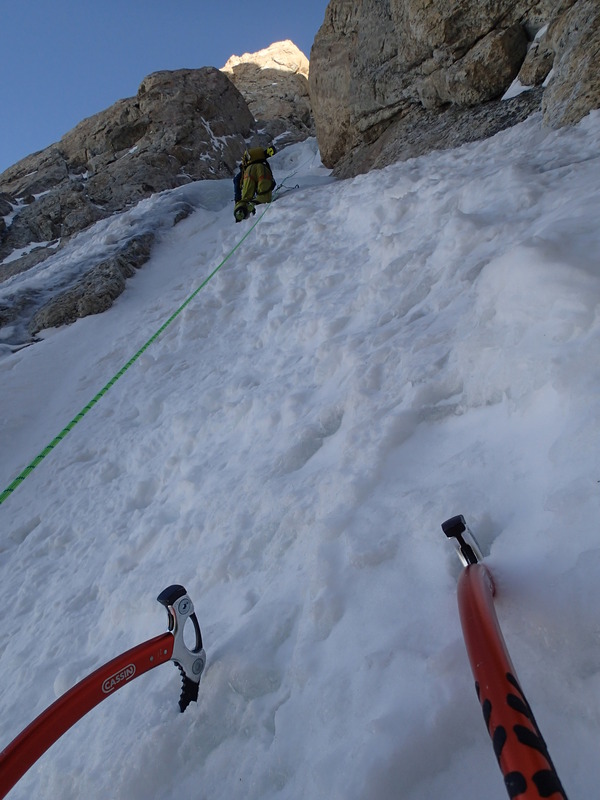 After gaining the Glencoe Col it was time to get into the meat of the technical climbing. For Dan and myself, it was our first time on the GT with skis on our back. It was my first time doing any ice climbing outside of the snowking ice park, and it was Dan’s first time ice climbing at all. Needless to say, we were stoked! Adam led the way over a couple ice bulges that provided some fun moves. Stoked on my new ice tools! Dan swinging his Alpax axes! 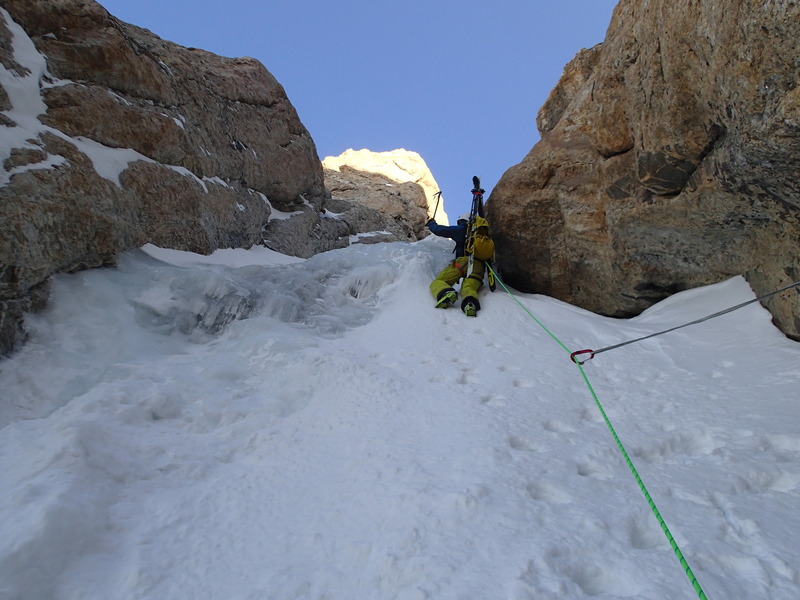 We finished off the last pitch we would rope up for, and rigged our ropes for rappel on the way down. Another gear cache, woo! From here we moved relatively quickly to the East Ridge and up to the summit. The summit was a bit blustery, but we were overly excited to be hanging out on top. We spent about a half hour snacking, drinking water, applying sunscreen, and taking in the views. Feeling reenergized, we were ready to ride! Adam making turns, with Dan and I photographing! New snow in the week leading up to our adventure stunted the corn cycle and left conditions up high pretty firm. 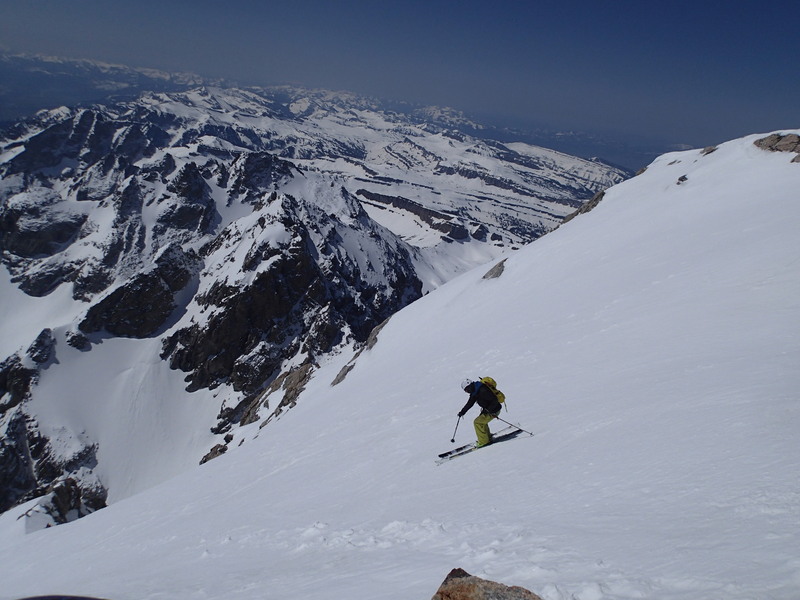 We skied a mix of dust-on-crust and a generally hard, but edgeable surface. Given that basically all of the skiing off the top of the Grand is a no fall zone, we kept it conservative and took our time heading down. After some rappelling shenanigans and retreiving our gear at the top of the Teepee, we finally got to harvest some nice corny turns which quickly changed to slush as we approached the meadows. Things got pretty wet and dirty below the meadows as we worked our hardest to connect snow patches. I definitely shredded lots of bare ground and rock as we tried to stretch the snow-sliding as far as we could. Between my fatigue and the isothermic snow, I managed to take a few quality falls in the sloppiness. It felt like I was post holing with my snowboard on! Our grand scheme to ski back to the Bradley-Taggart trailhead became increasingly more questionable, but we eventually found ourselves on a completely dry trail. We could basically smell the car at this point. We put the skis on our back and completed the final slog back to the trailhead. 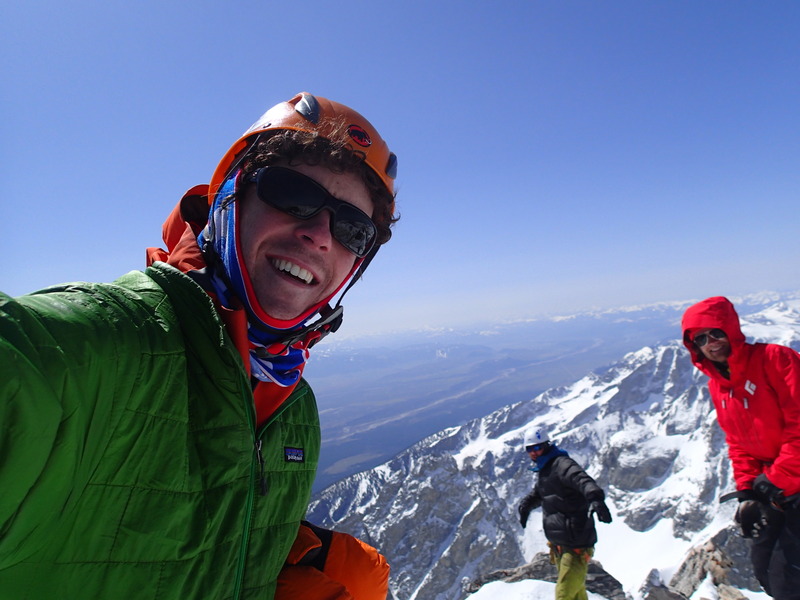 A long, but successful day in the Tetons!